The dentist and staff from Green Dental of Alexandria are here to serve your family with state-of-the-art, environmentally conscious and personalized dental care. We are a family dental practice located in Alexandria and serving children and adults of all ages from Alexandria, Arlington, Falls Church and the surrounding areas. Our practice offers a full range of preventive and general dental care designed to help you achieve and maintain a naturally beautiful, healthy and fully functional smile, for life. In addition, we offer a full range of restorative and cosmetic dental services as well as orthodontics and sedation dentistry. We want to be the dental practice you count on to meet your dental care needs and the dental care needs of your entire family. Choosing a dental practice to care for your family is a big decision and should not be taken lightly. Green Dental of Alexandria features an experienced, compassionate dentist, Dr. Hye Y. Park, as well as a team of dedicated dental support professionals. Together we strive to provide the highest quality dental care possible, in an atmosphere that is relaxing and comfortable for our patients. Our first priorities are patient safety, patient care and protecting the environment. Using the best and safest materials the industry has to offer, the most advanced dental technology and eco-friendly systems, we deliver top quality, green dental care to families throughout Alexandria and the surrounding areas. At our dental office, you can enjoy massage dental chairs, scented facial towels and movies while you are receiving dental treatment. We also offer complimentary beverages, Internet access and reading materials in our waiting room. We have a playroom filled with toys, movies and video games to keep your children entertained and looking forward to their appointment. For patients who are more anxious about their dental appointments, we offer several sedation and relaxation options. For your convenience, our family dental practice accepts many dental insurance plans as well as cash, checks and credit card payments. We also offer flexible financing and in-house payment plans. To accommodate our busy parents and working professionals, we offer extended hours as well as Saturday appointments. 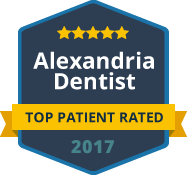 Please contact our Alexandria Family Dentists today to schedule your appointment. We look forward to caring for your family!